Domaine Les Pallières is undeniably one of the greatest, longest-running properties of the Southern Rhône--outside the village of Gigondas, woven into the foothills of the beautiful and brooding Dentelles de Montmirail. The domaine had been a continuously running farm within the same family since the fifteenth century! Les Pallières was once a famous domaine with wines of impeccable character, yet the property had slowly fallen into disrepair. Two great frosts of the twentieth century had killed off many of the olive and fruit trees, and both the winery and the vineyards were badly in need of repairs. By 1998, the Roux brothers wanted to make a change. With no future successors to take their place, they decided to sell. 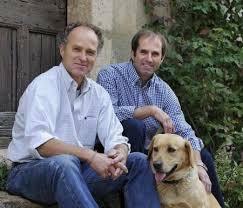 The Brunier brothers, Daniel and Frédéric, of the famed Vieux Télégraphe in Châteauneuf-du-Pape, were rising stars in the Southern Rhône at the time, having distinguished themselves time and time again with world class wines. A casual discussion over lunch at Chez Panisse between Daniel and Kermit Lynch, the Brunier's longtime American importer, spontaneously turned into a game plan to revive the faded jewel--Les Pallières. Though the competition to buy the domaine was fierce with very reputable names in the mix, the Roux brothers finally decided to sell to the Bruniers and Kermit. After decades of neglect, Pallières' renaissance had begun.